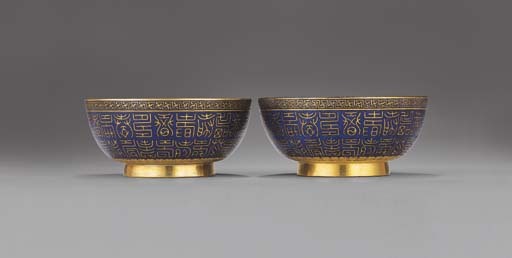 The bowls previously sold at Sotheby's Hong Kong, one on 26 October 1993, lot 314, and the other, 29 October 2001, lot 725. A similar, slightly shallower, bowl of this design, inscribed with a Jiaqing mark, is illustrated by H. Brinker and A. Lutz, Chinese Cloisonné: The Pierre Uldry Collection, Zurich, 1989, pl. 347. Another example of a single bowl in the Beijing Palace Museum is illustrated in Metal-Bodied Enamel Ware, The Complete Collection of Treasures of the Palace Museum, Hong Kong, 2002, pl. 154.